HSC bodies regularly identify and qualify solutions to unmet clinical healthcare needs, and by working with industry and academic partners, these solutions can be refined and developed into products through collaborative partnerships. CHIC has been pioneering a new model of academic and industry collaboration and by partnering with HSC the collaboration can bring resources, skills and insights to address both emerging and current healthcare needs. The collaboration between CHIC and HSC will streamline the assessment of how emerging technologies and innovations will become tools to improve the healthcare professionals ability to deliver better care. These emerging innovations have the potential to benefit patients and citizens. This could position Northern Ireland as a leader in healthcare supported by technology if it harnesses the available skills and knowledge base. 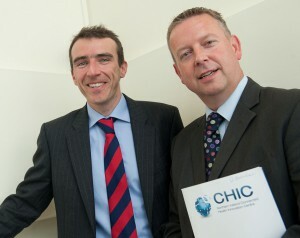 One such example is a project coordinated by CHIC and HSC Innovations working with Randox Laboratories Ltd, Exploristics, EMC and Southern Health and Social Care Trust, whereby the CHIC member companies are looking at utilising new analytics and big data techniques applied to diagnostics in order to improve health outcomes. Each of the collaborating companies are able to bring their domain expertise to the project to work with the CHIC researchers. Further value is then being added by the CHIC researchers utilising the expertise of the HSC clinical base, in this case Southern HSC Trust. The relationship between HSC and CHIC will develop further as we continue to explore joint collaborations to support emerging healthcare needs. The strong relationships are also key to attracting further funding to Northern Ireland and investigating emerging technologies to promote greater independence, self-care and better use of technology outside of the hospital. HSC, CHIC researchers and the CHIC member companies recognise that the pace of change and innovation requires new models of collaboration which can position Northern Ireland to address healthcare needs and contribute to the regional economy. The Northern Ireland ecosystem of academia, business and healthcare is big enough to be clinically relevant but also small enough to respond quickly in a joint and cohesive manner. Dr Brownlee concluded “by working in partnership with CHIC, we will ensure that new ideas and concepts that provide solutions for unmet clinical needs and have commercial potential, are given every opportunity to be identified, realised and developed to improve patient care”.